I had this wine twice in two nights at Scotch Bar, Blenheim. 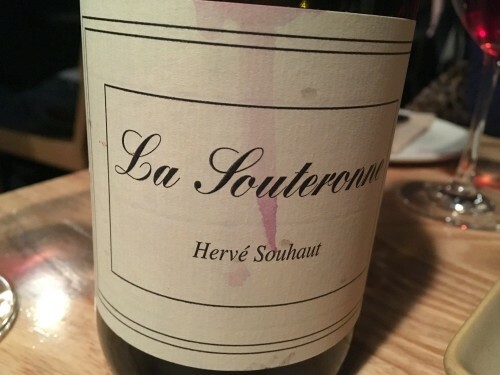 It’s from Hervé Souhaut’s Domaine Romaneaux-Destezet, which is based in Arlebosc in the Ardèche, just west of Tain l’Hermitage. Indeed, as well as his Ardèche holdings, Hervé has some vines in the northern Rhône, with a total of 5 hectares altogether. He started out in 1990, after he’d spent a year working with northern Rhône natural wine stars Dard et Ribo, and he actually has the press that was used by Jules Chauvet, the father of natural wine. This Gamay is from the Ardèche vineyards, where he has 1.4 hectares of old vines (60-80 years old) that yield a miserly 25 hl/ha. It’s made by partial carbonic maceration with whole bunches, and then aged in old oak for eight months. Hervé uses very little SO2 (with a total of only 25 mg/litre, with the only addition being at bottling), yet his wines are very pure. Natural wine at its finest.